Nutmeg oil is derived from evergreen tree jatiphala, scientifically known as Myristic fragrans (or also known as M. officinalis, belongs to Myristicaceae family. Nutmeg tree grows up to 70 feet in height and it has dense foliage and small dull yellow flowers. Its native regions are Molusca islands, also commonly cultivated in Sri Lanka, Java and Penang. Extraction: Nutmeg oil is acquired from dried seeds kernels of nutmeg tree fruit through steam distillation method. Nutmeg oil is composed of alpha-pinene, camphene, beta-pinene, sabinene, myrcene, alpha-phellandrene, alpha-terpinene, limonene, 1,8 cineole, gamma-terpinene, linalool, terpinen-4-ol, safrole, methyl eugenol and myristicin. Nutmeg oil is clear and thin in consistency, its aroma is strong, spicy, rich and sweet. Nutmeg is nicely blends with black pepper, cypress, geranium, clary sage, rosemary, ginger, ylang ylang and orange. Nutmeg oil alleviates pain in muscles, joint pain as it is anti-inflammatory so that it is effective against arthritis, rheumatism and lumbago. It is used for the treatment of menstrual irregularities and menstrual cramps and reduces depression and hormone imbalance. It promotes digestion and provide relief from stomach aches and alleviate flatulence, vomiting and diarrhea. It acts as stimulant, it increases blood circulation. Nutmeg oil provides relieve from respiratory issues such as cough, syrups and cold rubs, congestion. It is used as brain tonic, it provides relaxes in mental exhaustion and stress, it increases concentration and efficiency at study and work. It provides relieve in heart issues as it stimulates cardiovascular system and act as heart tonic. It helps in treatment of liver diseases and removes toxins from the liver. It also improves kidney health and helps in dissolving kidney stones and accumulation of uric acid in body parts. Also treats gout and joint inflammation. It removes bad breath, also effective in toothaches and aching gums so it is added to toothpastes and mouthwashes. It is used to flavor in baked goods, sauces, ice creams and custards and in certain coffee drinks includes cappuccino. It is used as ingredient in antiseptic soaps, used in bathing due to its refreshing nature. It is used in cosmetics for dull, oily or wrinkled skin, so used as ingredient in lotions and creams. It is also used as room freshener because of its woody and pleasant aroma. It is also added to tobacco to change the flavor of tobacco. Avoid excessive use of nutmeg oil as it can be toxic with symptoms of nausea. 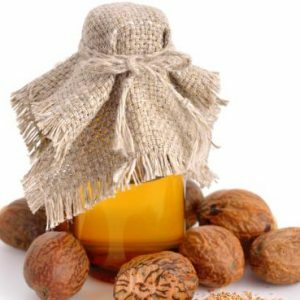 Do not take nutmeg oil during pregnancy. Appearance : Colourless or pale yellow liquid. Storage : In well fitted container in cool and dark place.